Note: Fibre-Metal discontinued their popular 2030 welding ear muff. For a direct replacement that is exactly the same as the Fibre-Metal 2030 ear muff, except with black, instead of red ear cups and a much better price, choose the Tasco T-2000 on this page. 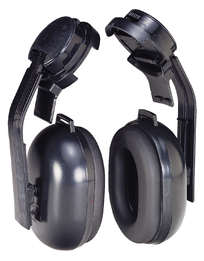 Tasco T-2000 Hard Hat Model Dielectric Ear Muffs are Tasco's most popular, best-selling hard hat mount ear muff. These T-2000 Hard Hat Model Ear Muffs feature Tasco's patented Soft-Seal™ ear cup cushions and an extra low profile design for comfort and wearability. The T-2000's high quality features, along with the fact that this is currently Tasco's most economically priced cap-mount muff, add up to an excellent value. Tasco 30065, 29505, 29005, 27005, 60005, 22935 Replacement Ear Muff Pads fit the following Tasco Brand ear muff models: Nextera, Golden Eagle, Sound Shield, Blackhawk, Apache, Woodsman, and all other Tasco Earmuffs. Tasco T-2000 Hard Hat Model Dielectric Ear Muffs (NRR 22)5Dick KafkaJuly 18, 2016excellent replacement ear muffs for my helmet. Lost an earmuff in the field, and these are good replacement set. Easy to install, and good decibel rating.